Red flowers may fit a Valentine's Day theme. 3 What Are Seasonal Colors for a July Wedding? Planning a February wedding often allows you to negotiate prices with vendors because fewer couples get married in the early months of the year. Although there are benefits to a February wedding, it can be tricky to choose colors and flowers that fit the season. Your area may still be in the midst of winter or just entering spring on your wedding day, so consider wedding themes that complement the weather and season. In many areas, February brings snow and chilly temperatures, making it a perfect time for a winter wonderland themed wedding. Avoid red and green color combinations to keep your celebration from looking like Christmas. Instead, choose icy colors such as silver, ivory or rich grays. Incorporate these colors into bridesmaids' dresses, groomsmen's tuxes, flowers, centerpieces and invitations. Decorating with candles keeps the atmosphere warm and inviting. 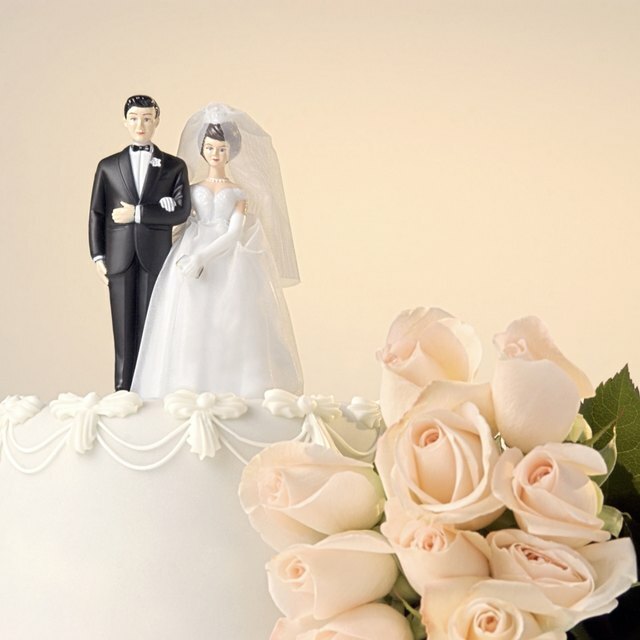 Many couples choose to celebrate their love by getting married on Valentine's Day. Create a Valentine's Day theme by incorporating red or pink into your decorations. Bouquets of red roses conjure feelings of love and romance, while pale pink bridesmaids' dresses are an appropriate accent color. Extend the Valentine's Day theme into your food and drink selections. Opt for a red velvet cake or one with raspberry filling, and make a pink cocktail your signature drink. If February in your region means rising temperatures and blooming flowers, consider choosing a spring wedding theme. Create your wedding theme around a favorite spring flower, such as lilies, daffodils or tulips. Incorporate the color and features of the flower into your bridesmaids' dresses, favors and invitations. Using overflowing vases of your featured flower as centerpieces emphasizes the theme and creates an inviting spring atmosphere. Many February weddings must be held inside because of poor weather, making this an excellent opportunity to have a lavish indoor celebration. A Parisian or Versailles theme allows you to create an atmosphere of luxury. A large ballroom decorated in a neutral color palette fits with this theme. Gold, silver, pale pink, peach, pearl or dusty rose colors evoke feelings of French opulence. Food options include serving French wine with a variety of cheeses, setting up champagne fountains, passing French hors d'oeuvres or serving a classic French meal.